Himmelhost Barrow is a small burial ground just east of the Iggnir River, about halfway between the mouth and the east shore. During your travels, you may come across the Himmelhost Barrow on the southern shore of the island, east from Fort Frostmoth. Inside are a number of Skeleton Pirates and a Skeleton Pirate Captain, who wields the unique blade Seasplitter. None of the undead are particularly difficult if you can engage them one at a time. There are a number of treasure chests in the small cave (maximum lock is around 65) with some decent loot, and a single sample of Stalhrim. Be sure to get the key from the Captain along with a note which seems to mention a treasure hoard. If you haven't progressed very far in the Main Quest and haven't explored the island yet, the treasure note may not make any sense. 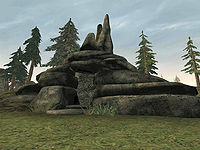 The sun's great stone is the Sun Stone encountered during the main quest and is located on a hill northeast from Fort Frostmoth, east of the Iggnir River. The arch mentioned in the note is the large stone arch over the Valbrandr Barrow, a little north from the Sun Stone. Once you've found the arch, look around the base of it until you've found the muck on the northeast end. Underneath the muck is a Pirate's Chest (100 lock) full of treasure (5,000 gold, gems, jewelry, etc. ), which the Captain's key will open. This page was last modified on 1 January 2019, at 13:11.